Ring of Fire is inspired by the Anishinaabe Seven Grandfather Teachings: Wisdom, Courage, Respect, Honesty, Humility, Truth, and Love, which serve as the basis for the organizational structure of the procession (the “bands”) as well as guides the working principles of its making. Young spoken word poets from Jane-Finch, Malvern, and Regent Park play the roles of “Orators” in the procession, addressing the public as the procession weaves down University Avenue. For the past year these young poets have participated in a mentorship program across the city of Toronto at COBA (Regent Park), Success Beyond Limits (Jane-Finch) and The Malvern S.P.O.T. (Scarborough), where they have learned about the Seven Grandfather Teachings and produced new poetry inspired by them from their own point of view. 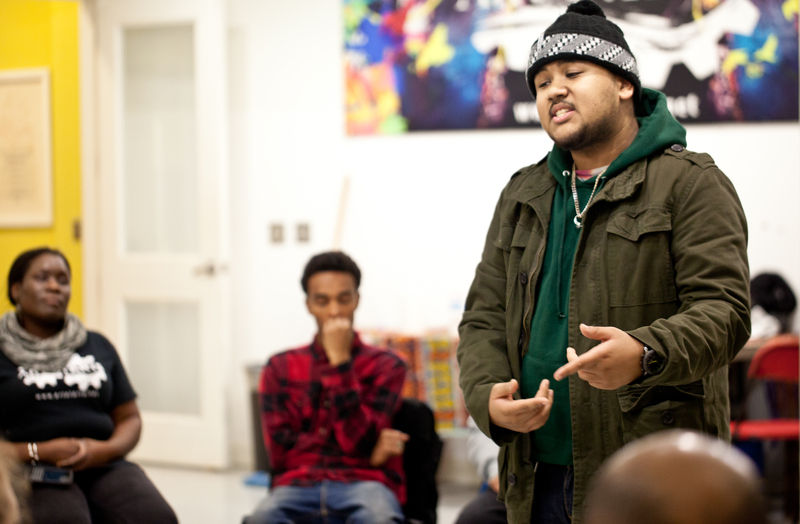 Moose is an emerging spoken word artist who grew up in the Jane-Finch community. He has performed his poetry at 106 and York, Freedom Fridayz, (York Woods Library), and Poetry Saved My Life (Toronto Public Library). Moose was also a featured performer at the book launch of Rhymes to Re-Education and at Dare 2 Dance, Dare 2 Speak, an event showcasing youth talent at the Toronto Centre for the Arts. Wisdom’s orator is accompanied by Anna Wren, a young Deaf ASL Signer. At the age of 19, Bidhan Berma is a wordsmith whose passion cannot be questioned. As a member of UNIFFECT and BTdot, he has honed his ability to perform and enjoys spilling his soul on the stage. At a young age, Berma encountered many hardships only to come out stronger. He uses his words to speak out on issues that affected him and to help those who are dealing with the same things. Courage’s orator is accompanied by Sage (Nicka Nobles), a Deaf ASL Signer. Jacob Agustin aka JaayRoyy is a spoken word artist and rapper, born and raised in Toronto. 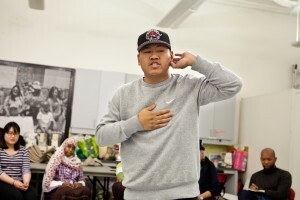 Jacob is an active member of UNIFFECT and UNITY charity and was also a member of the 2012-2013 BAM! Toronto Youth Slam Team, which was crowned as the first ever Canadian National Youth Slam Champions at the inaugural YouthCanSlam. 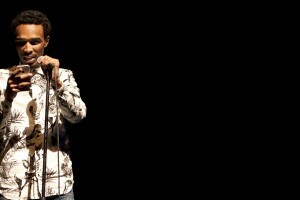 He is also part of Ryerson University’s spoken word team, which recently competed at CUPSI (College Unions Poetry Slam International). Respect’s orator is accompanied by Anthony Turner, a Deaf ASL Signer. Suviana is an emerging spoken word artist who reflects upon political issues, and general themes of love, happiness, and tragedy in her poetry. In 2014 Suviana had the honour of performing her poetry with Sonia Sanchez, a leading member of the Black Arts Movement at the 4th Annual Celebrating Women’s Voices in honour of International Women’s Day at Ryerson University. Honesty’s orator is accompanied by Gaitrie Persaud, a Deaf ASL Signer. 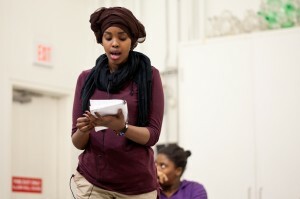 Zeinab Aidid is a Toronto based writer, speaker, spoken word artist, and educator. Born to Somali immigrant parents, she draws upon her experience navigating the world as a black, Muslim, woman. She’s inspired by her storytelling ancestors as well as the many artists in her life. When she’s not performing Zeinab spends her time facilitating writing and spoken word workshops for youth all around the city. She hopes that through her work she will guide young people in finding their voice while creating a space for alternative narratives. Truth’s orator is accompanied by Timyka Bullens, a Deaf ASL Signer. 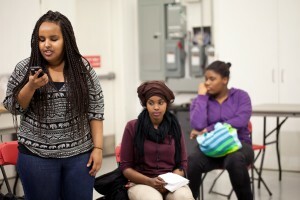 Nadia Adow is an aspiring spoken word artist from Regent Park. In 2014 she participated in the Ada Slaight Youth Arts Mentorship program and was featured in H.E.A.R.T., a live talent showcase at the Daniels Spectrum. She has performed at a number of events across the city including Volume Sisters Make Noise; and RISE at the Burrows Hall Community Centre. Humility’s orator is accompanied by Marwa Normohamad, a Deaf ASL Signer. Destiny Henry is a multitalented emerging artist. 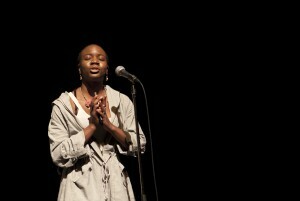 She has performed at Poetry Saved My Life, at the Toronto Public Library in May 2014, Ryerson University for International Women’s Day; Word Sound Power at the Harlem Underground; the Toronto Poetry Slam at the Drake Hotel; and The Roots Poetry Lounge. 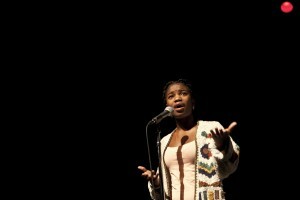 Destiny was a performer in Dare to Speak, a TDSB competition and showcase for emerging spoken word artists in high schools. Love’s orator is accompanied by Cassie Rehman, a Deaf ASL Signer. For the past year these young poets have participated in a mentorship program offered by the AGYU across the City of Toronto at COBA (Regent Park), Success Beyond Limits (Jane-Finch) and The Malvern S.P.O.T. (Scarborough) where they have learned about the Seven Grandfather Teachings and produced new poetry inspired by them from their own point of view. These young poets were mentored by some of Toronto’s most respected word warriors David Delisca, Jordon Veira, and Britta Badour. Credits: AGYU’s year-long spoken word poetry program was developed in partnership with the Malvern S.P.O.T, Success Beyond Limits, and COBA with the support from the Honey Family Foundation and the Vital Toronto Fund at the Toronto Foundation and the Toronto Arts Council: Targeted Enhanced Funding.